I work at the UO Cultural Forum as the regional music coordinator. 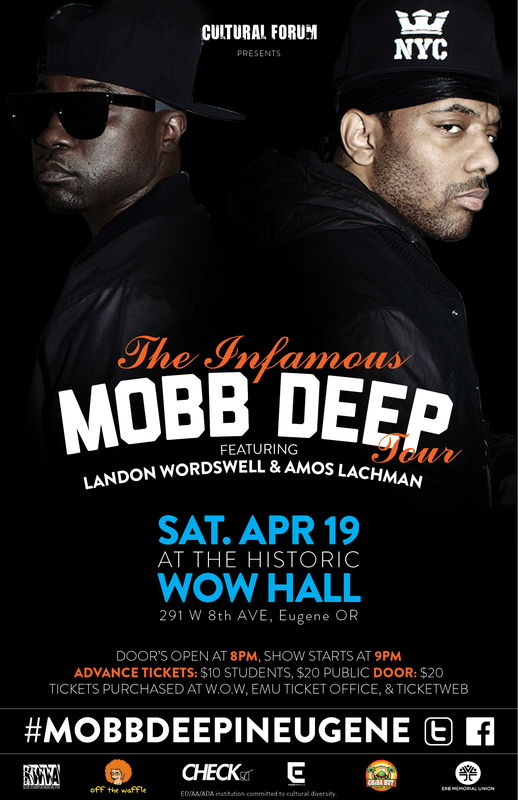 I have a concert booked with the infamous hip-hop group Mobb Deep coming to the W.O.W. Hall Saturday April 19th. As I think about ways to promote this event I can’t ignore the fact that posters around the school and community is a must. However, my generation gobbles up social media like starving families on Thanksgiving. That makes social media a must too. Then I read these. How Could Snapchat Make Money? After reading these three articles, I’ve come to the conclusion one of the best ways to raise awareness about this event is to create a social media marketing campaign. Even though we might not be there just yet, these three articles make me believe that it is possible to promote an event solely on social media sites. By using the poster created above with a hashtag and with a large enough network, I could potentially share the above poster on Instagram and Snapchat. Creating “Insta-awareness” and “Snap-awareness.” After being exposed to the event and with a hashtag to utilize, people can then talk about the event on Twitter and Facebook with other interested publics. This in turn will create further buzz and awareness. The ultimate objective is for word of mouth to help spread the campaign, but also for people to post, comment, and re-tweet the poster. Like any good PR campaign, you want to be able to measure the success and see how many people it made impressions on. This is somewhat difficult to do except for clicking on the hashtag and seeing who is actually talking about the event. The only way to know how successful a campaign like this can be is how it affects the bottom line. That is, if people actually buy tickets. Is there enough “call to action” in this campaign? Only the day after the show I will know, because I’m pursuing it. For a recent PR class assignment, I decided to create an infographic of one of my favorite all time bands, the legendary rock gods Led Zeppelin. Infographics are valuable because they tell a story using minimal text. They are a fun, creative way to spice up a topic and help the reader visualize data. For instance, I could easily tell you that Led Zeppelin is one of the greatest rock and roll bands of all time. Then I could spend an entire paragraph on an information dump with statistics on why and how they are so successful. With an infographic, I don’t need to TELL you, I can SHOW you. And that, my friends, is the power of the infographic. Before I share some personal tips with you, here is a great article on how to create a fruitful infographic. -Who is this infographic for? Who are you trying to reach and what are you trying to say? Basic, but oh so very important. -Go on google and look for infographics. Pick one you like and try and follow it. 3. Draw the infographic on paper before you start using any software. -Not only will this help you visualize your data better, but it will also help you realize what you are really trying to show in your infographic. 4. Make sure the images that represent data on your infographic tell a story and correlate. 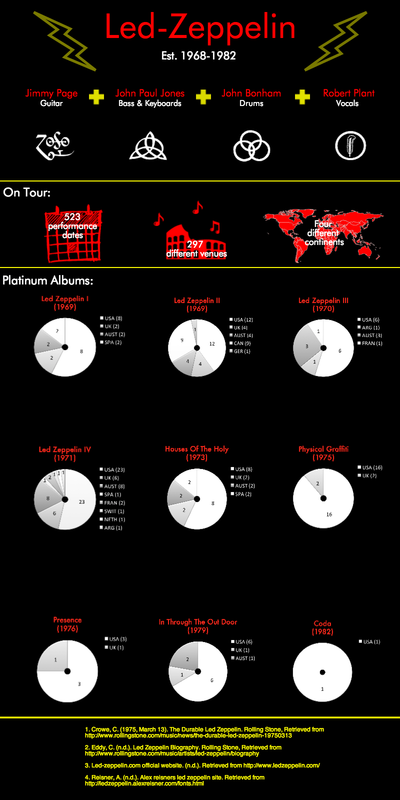 -I used record looking pie charts in white and grey to symbolize a platinum album. Match your word to a picture to symbolize an object. -Don’t go over the top and try to do something outrageous thinking you are super creative. Everything will be overwhelming to the viewer. The best infographics are clean, color coordinated, that use classic fonts, and empty space well. Now that the overcast gods have let me start my own blog, before I continue, let me tell you a little about myself and why I am contributing to this blog. Music has always been deeply embedded in my life even though I didn’t realize until my freshman year of college. As a kid I was always surrounded by music, and I feel that my background is one of the main reasons why I love music so much and want to get into concert promoting. My father listened to big bands and jazz music, sprinkled with some classics like Frank Sinatra and Ella Fitzgerald. My mother, on the other hand, was all about salsa and Latin music such as Marc Anthony and Rey Ruiz. Although, these are only a couple to name of few, this is what they would most likely listen to on any given day. However, they both were diverse and had plenty of different types of music to choose from depending on their moods. This kept me open to any type of new music I could get my hands on. Additionally, my dad used to play classical piano which opened me up to Beethoven and Mozart. Weekends I spent with my mom were filled with her sprucing up the house and blasting salsa songs loud enough for the entire neighborhood to hear. She never liked cleaning but she always made it fun for herself by practicing her salsa moves to the beat which she would clean and move around the house. For instance, instead of simply just walking to dust a filthy surface, she would Meringue over to practice her moves, duster in hand, and make cleaning the house more enjoyable. Having my parents participate in activities involving music during these times definitely stimulated my growing love for music since it was constantly around me. One night during my freshman year in college I had a dream of promoting concerts at my own venue in San Francisco. (Yes literally a dream). It. All. Made. Sense! I have always been envious of people that could play an instrument. Raised as a businessman from my father, I didn’t feel like I had the genes needed to succeed. Concert promoting was the niche I had been searching for. It combines business and music into one. Ever since that day I have had that career goal in mind. After spending three years as an intern at a concert venue called the W.O.W. Hall, today, I channel this passion through my job as the regional music coordinator on the University of Oregon campus. In short, this blog will be about everything music, which is my topic of interest. It’s purpose is to demonstrate my knowledge and show you my excitement for the music industry.